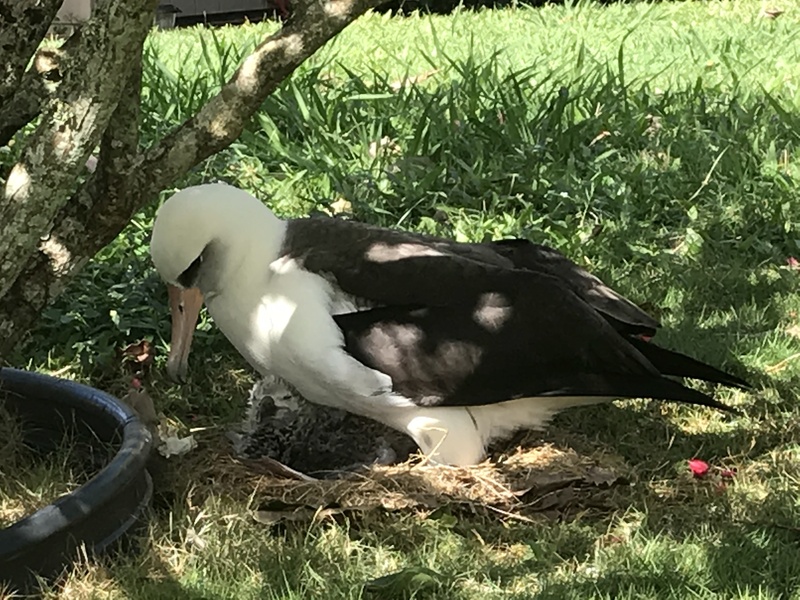 This is an exciting time of year for guests at Kauai Vacation Rental at Honu Point as Laysan Albatross chicks are “pipping” up and down the street. Introducing one such chick that was born within the last two weeks. It sits on a nest four doors down from our home. The mother and father alternate flying 1000 miles away to find food and bring it back to feed their baby. Such dedication and love. I happened to be driving by on Wednesday when I spotted the adult preening its young. Best with sound. Enjoy! I Got To Play Tourist For A Day On Kauai! Tom and I (Rae-Marie) started vacationing on Kauai in the early eighties and fell in love with the island lifestyle and weather. We moved over from San Diego in 2000 and live just 5 minutes from Honu Point. Our daughter, her husband, and the grandkids visit us often. In 1987 we chose our lot because of its views. It is a half acre on the ocean bluff which includes a 130 foot long peninsula that is mostly surrounded by water. No other property in Princeville has this characteristic.Having lived on the island for many years, we have had plenty of time to carefully design our retirement home so that every room has a dramatic whitewater view. Construction of our 3 bedroom/4 bath dream home was completed in 2015. Now is your chance to enjoy this property before we make the decision to move to it from our current island home. Being so close we would be happy to meet with you and offer suggestions to enhance your experience on the Garden Island. Rae-Marie and Tom have created a truly elegant home in paradise, with tremendous thought put into everything from the fantastic design of the home, the lush landscaping and grounds, the perfectly equipped kitchen, the abundance of towels and linens, and of course the unparalleled views from each and every corner of the house. The love and care they put into every detail is apparent, and adds to the experience of being there and feeling utterly pampered. Copyright © 2019 Honu Point. Powered by WordPress. Theme: Accelerate by ThemeGrill.